When choosing the 'Evergreen' research (tier 2, left side) in your druid order hall you'll get two plots you can activate to grow random buff items. This is one of the possible outcomes! Seems not to increase mount running speed, probaly because of the guild perk, but works on normal running speed. This item can be obtained through the Evergreen Order Advancement Perk. Does not increase movement speed while mounted. Does not increase swim speed in travel form. Does increase run speed in travel and cat form. Does stack with Feral Affinity/Feline Swiftness. Does stack with Stampeding Roar and Dash. 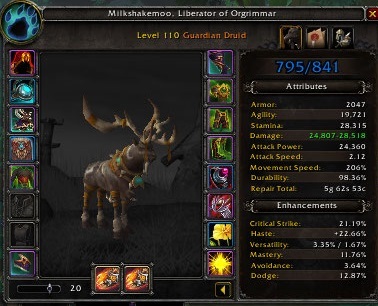 I wish they had given us an item which increased travel form to full mounted speed when out of combat and did not need to be equipped (as a trinket). But oh well. Perhaps it will be good once new tiers come out, people will have ilevel like 960 from raids and will be oneshotting all non-elites in open world. Also, the movement speed boost from Displacer Beast (50% for 4s) worked when you are in stag from! Sprint also stack, but cat form only 30% movement speed, and Sunblossom Pollen is not working in catform, but it still faster than stag from! /script UIErrorsFrame:Clear()Adding in the line /use 4 30 (I keep the trinket in the last slot, #30, of my last bag, #4). This works if I strictly use the macro to enter and exit travel form, but does not work well if I jump immediately into bear form (it keeps the travel trinket equipped). Ideally, I'd like a script to check if I am in travel form (and cat form, optionally) and then swap trinkets; likewise, check if I am out of travel or cat form, and re-swap back. I know that no matter what, if I get in combat, I am stuck with whatever trinkets are equipped, but I was hoping a script-wizard would step in and give this problem a whirl. Without a decent macro, this thing is nearly useless in Legion, as one is often getting into combat while running through stuff, and when flying comes in, there will be no use for this at all. Very disappointing implementation of a moderately-useful item. I looted two of these from two plants back to back. I am getting one of these every time now. I have 4 and am sick and tired of them. Now the Travel Form is 100% by default, this *does* seem to stack with both Travel Form and Sunblossom Pollen. My Travel form movespeed was an obscene 242 running around in Dalaran last night. Will try to get a screenshot today. Oddly, the blossom doesn't work by itself, only if I have the pollen active. So that's probably a bug. This had stats added in 7.1, which helps a lot. I equip it when doing world quests and now if I forget to swap it out when I head into a dungeon it's not an effectively empty slot. Even with the new buff to travel form speed this is nice to use while charging around in bear form rounding up mobs. I am on my 5th drop of this item. Does not seem to care that I have already received one. Does not care if I have one in the bank. Does not care if I have one in my bags. I guess it is just free gold. Ever since the 7.1 patch arrived, I have gotten one of these from my druid's evergreen plots ever other time I pick them... so an average of 1 a week.... ish. It would be nice if they'd change it so you don't get another one if you already have one, that way I could get something else that's at least remotely useful! It doesn't work with the Travel form anymore (100% out of combat). But still does while being in any other form. Create a macro, paste the above text in the macro, drag the macro onto the action bar and press it while moving. To show hidden stats, like movement speed. Equip: The Perfect Dreamgrove Blossom increases your movement speed by 20%. Only usable on the Broken Isles and Argus. "The petals are all perfectly intact."